The Bungie Armor at the Appearance screen. The Bungie Armor is an Armor Permutation only available to Bungie Studios employees (and Bungie members on 7/7/10). The armor is visually identical to the EOD Armor's chest piece, save for its fire effect and the absence of the EOD Armor's lights near the shoulders and center. In contrast to the Recon Armor, which for a time was a Bungie-only armor set, the Bungie armor will not be given out to anyone outside the company. As a con, however, the flaming head is still visible even when in Active Camo, negating its usefulness. This could lead to many frustrating deaths, especially during invisibility-related games. The Legendary Edition of Halo: Reach garners players a similar armor effect for use in campaign and multiplayer. However, the flames extinguish during in-game cutscenes. A similar previously Bungie-exclusive effect was developed with the "Eternal" armor effect, but the flames are blue-purple instead of orange. When Bungie was asked, "Since Frankie left, does he still have his Flaming Helmet?" it was replied with, "The flame has been extinguished." The only two exceptions to Bungie's employee-only rule is Nathan Fillion and the other being Pope rex, the winner of the Sarkathlon 4 event. Bungie advertises the armor on their website with the logos "Get hired, get fire" and "Game with Flame". The appearance of a flaming head is probably another reference to flaming ninjas, which Bungie often refers to. A popular misconception is that Bungie's Flaming Helmet is actually a variant of the Recon helmet. In fact, it is a flame on the collar and is a chest piece that is based on the EOD armor. The Bungie Chest Piece creates the flame on the player's head which can be used with any helmet and shoulder piece. In Halo: Reach's new multiplayer gametype, "Headhunter", flaming skulls appear when a player takes a headshot and the same skull is used as the oddball in the respective gametype. This is a reference to both flaming helmets and another Bungie meme, flaming ninjas. In celebration of Bungie Day 2010, Bungie gave the armor to every Halo 3 player for the day. In addition to this, the distinct Bungie logo that appears next to an employee's gamertag as a distinguisher was also applied to everyone for the day. This is because the Bungie logo is a linked effect of the armor. A picture of the Armor Permutation. The one drawback of Bungie Armor. The armor permutation on Bungie Day. 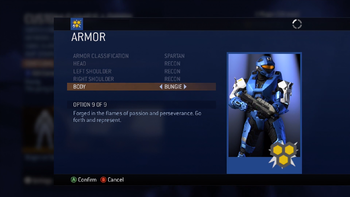 The analogous version of the armor in Halo: Reach, consisting of the formerly employee-only Eternal armor effect and the Haunted helmet.